I loved this shot! Brilliant, considering the length of the takes. And is this plays in real-time, the party was awfully short. Probably about 40 minutes long. Those poor guests who probably were longer on the road then the party took. I thought it was a natural length. The combination of worrying about David and realising how manipulative Brandon was being was enough to kill the atmosphere. Although, the problem that Hitchcock should have foreseen: If the viewer is beginning to be amazed with the technical brilliance then it takes away from the immersion. While that's true, it's only nerds like us that marvel at such things because the average viewer just gets the subconscious affect the director was after. I mean, here's a nerd test: did you spot the crack at the top of the doorway to the main room? That's where the set could slide apart to allow the camera to move around! While that's true, it's only nerds like us that marvel at such things because the average viewer just gets the subconscious affect the director was after. I mean, here's a nerd test: did you spot the crack at the top of the doorway to the main room? I have, however, watched the highly interesting featurette on my disc, which showed the monster of a camera. Eve (Jane Wyman) is an aspiring actress determined to clear her friend Jonathan (Richard Todd). He is accused of murdering the husband of his lover (Marlene Dietrich), also an actress. 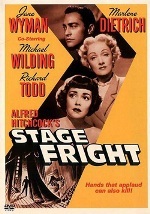 In many ways Stage Fright feels like a step backwards. The format is similar to the cross-country, framed for murder plots Hitchcock has done so well before and features one of those romances that always come across so naive, especially after Notorious. It doesn’t help that Jane Wyman’s Eve can’t seem to make her mind up. Key moments are played out to an audience or on stage, something that has always fascinated Hitchcock, from The 39 Steps to Saboteur. Although the rather gruesome (implied, anyway) end is a new development! So it is disappointingly old-fashioned and even more of a letdown if you read the DVD case and might have been expecting Hitch’s take on Phantom of the Opera. It seems a bit messy and not very exciting overall, but it rewards repeat viewings as Hitchcock’s intentions become clear and you find this is typically ambitious and technically superb. The story is about duplicity and the theatre is not just a location this time, but is fundamentally woven into the plot. Everyone is playing a part. Charlotte, a classic femme fatale, is fooling everyone into believing she is the brave widow, while Eve takes on the role of her maid and dresser to gain information. By the end, several others are involved in a complicated plot to prove Jonathan’s innocence without involving the police. But beyond the plot, the screenplay is structured brilliantly to be duplicitous to the audience as well. Aside from the opening and closing conceit of the curtain, the flashback sequence was reminiscent of Citizen Kane. The flashback turns out to be false because it was told by Jonathan. This was rare in 1950 and unheard of before Citizen Kane, where the viewers perception of the character was altered depending on who was relating the story at the time. Kane was also noted for keeping focus, even in a deep depth of field. Hitchcock has played with this sort of thing before (the huge glass in The Lady Vanishes) and achieves a similar effect by super-imposing Dietrich into the foreground with Richard Todd in the back. Very clever and shows how he shared Welles’ determination to not be limited by mere physics! The complicated structure perhaps kills the suspense, but the early chase (Safety Glass! ), the finale and especially the wonderful sequence with Wyman trying to avoid Detective Smith (Michael Wilding) when she’s pretending to be the maid, are standouts. Perhaps it can be dismissed as a light and breezy caper, but overall the film is very entertaining, mainly thanks to British comedy legend Alistair Sim, who is a joy in every scene. Joyce Grenfell pops up too in a hilarious sequence at a shooting gallery. If you enjoyed these two, you must look them up in their home turf of Ealing and St. Trinian’s comedies. The rest of the cast are excellent too. Jane Wyman is essentially playing two roles, while Richard Todd plays up to and against his reputation. I tend not to enjoy Dietrich’s performances and I could certainly have done without the musical interludes, but still, she was perfectly cast here. I did enjoy how she kept undermining Eve’s complicated ruse; refusing to read what must have been a carefully forged letter and constantly getting her ironically false name wrong! This is not essential viewing so far as Hitchcock films go, but it’s a lot of fun if you don’t take it seriously, with bonus points for actually being pretty radical in its structure. Tennis ace Guy Haines (Farley Granger) meets Bruno Anthony (Robert Walker) by chance during a train journey. At first he appears to be a fan who knows a little too much about Guy, including his wish for a divorce so he can marry Anne Morton (Ruth Roman). He suggests a bizarre plan to “swap murders”, thereby eliminating motive. Guy pays him no heed until his wife is found strangled. 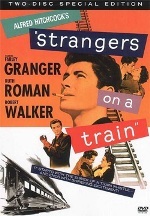 Strangers on a Train is one of the many timeless gems in Hitchcock’s career. Based on a novel by Patricia Highsmith, it’s a fantastic premise and it is executed in a watertight screenplay that ramps up the tension throughout. Like Shadow of a Doubt and Notorious, there is little that stands out as all the elements fit together perfectly balanced in a believable drama. It’s a thriller masterpiece. Robert Walker is superb as the unhinged, but intelligent Bruno and comes across as a viable threat. As in several of Hitchcock’s films, most recently Rope, Bruno talks about murder like some sort of socially acceptable pastime. Farley Granger was in Rope as one of those thrill seekers, but Guy dismisses it here as a joke. He convinces as the privileged individual about to join high society, but otherwise a perfectly normal man we can all identify with. And so his situation is terrifying. That his everyday comments about throttling someone should come back to haunt him, and the murderer has him over a barrel, with possibly the only feasible way out is to consider following the madman’s plan. With the added unspoken twist of course, that Bruno has done him a favour! Guy can’t avoid the fact he wanted Miriam out of the way. Luckily for the viewer, we want her out the way too as she is awful. Trust Hitch to make the audience feel just as guilty as the characters! The rest of the cast don’t really stand-out except for Hitch’s own daughter, Patricia, as Barbara Morton. She is the stock character who is obsessed with stories about murder, probably like her dad, and she is very funny. The murder scene is one of the best, as we see Miriam throttled in a reflection on one of the lenses of her glasses. There are few other obvious touches like this, except Hitchcock is expanding on the depth of field trick from Stage Fright (at least). This films real power though is in the pacing and editing. The final sequence is far more exciting that Wimbledon as Guy races through a tennis match, while Bruno is desperately trying to retrieve the all-important lighter. The great thing is, the whole sequence of him losing it temporarily is superfluous, but nail biting all the same. The finale on the merry-go-round is absurd, but utterly fantastic anyway. A stand-out set-piece. The DVD includes a “preview” version. There is very little difference, except this was the British version I believe. It was apparently edited to play down the homosexuality theme. It’s hardly explicit, but I can see where the story could be emphasised about two men and their clandestine plans binding them together. Apparently in the book, Guy goes ahead with his side of the bargain after all, which I find silly, but would twist their lives together even tighter. Yes, but in a movie the fun is guessing how they will get caught. But when they make such obvious mistakes, then the whole suspense is gone. Ok, now I've caught up, explain yourself! But seriously, what mistake did Bruno make? His whole idea about the crisscross hinges on the fact that they both have no connection to each other in any way. But at the first sign that Guy will not go through with it, he introduces himself to Guy's family thus establishing a connection, which would implicate both, if Guy would go through with the murder. Also if I remember correctly, he picked up the glasses of the victim. He did pick up the glasses, but he gave them to Guy as proof before the police could even report it officially. He had nothing to lose by introducing himself to the family. The point of the criss-cross was that they should have no connection, you're right, but the secondary objective was still solid: that they had even less connection with each others victims. Should Guy go through with it, police would be investigating two murders, I don't think Bruno had done enough to be associated with Guy's circle by the police and none of the other guests would pick up on it. In fact, his association and possible alibi would be with the Senator's family; Guy was just another guest at a large party. Is I Confess due for this coming Monday? I can't believe I've caught up! Hitchcock collaborated with renowned playwright 'Thornton Wilder' ('Our Town') to create this psychological tale of family drama, suspicion … and murder. 'Joseph Cotton' shines as Uncle Charlie, a seemingly charming man visiting his relatives in their small and peaceful hometown. But when his namesake niece, “Young Charlie” ('Teresa Wright'), suspects that he may in fact be the psychopathic Merry Widow killer, Uncle Charlie must plot the death of his favorite relation in order to remain one step ahead of the law in this murderous game of cat-and-mouse. Overall I enjoyed this movie. The plot is interesting, though there were slower spots in it made it harder for me to get interested and stay interested in what was going on. The pace did pick up more later in the movie and it was more interesting then. The characters are interesting and Uncle Charlie makes a good, creepy villain. Charlie is a decent main character as well. I didn't feel like there is as much suspense in the movie, but there is still some. I am surprised. I'd expected Shadow to be one of the earlier films in this marathon to get almost universal praise, but it appears to have fallen flat. I didn't think it was dated -beyond the obvious- but maybe it has. For me the slower parts simply emphasise the normality of family life and pace, and makes Charlie's integration all the more terrifying, knowing he could turn at any moment. It's a theme he used often, from Rebecca and Suspicion, to more recently Rope and Stage Fright, where someone's trust is tested to the limit and sometimes beyond. It's also similar to Strangers on a Train in a sense that a normal, peaceful life is being fundamentally threatened. For me, in both these scenarios, the slower the better! It makes the contrast far more tangible. I confess that I Confess is my favorite Hitchcock movie. I'm looking forward to seeing the reviews. Nice to hear, considering it isn't one of the well-known ones. I hadn't heard of it before I got my boxset and I am looking forward to seeing it again. But looking at the past opinions, where do you think they'll fall? Surely you could add your own to the topic as well though?